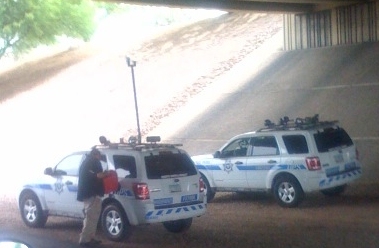 CameraFRAUD volunteers capture a "talivan" being refueled after the vehicle ran out of gas on Interstate 10 near Ray Road. Redflex seems to be running out of gas— literally and figuratively. A clause allows DPS to cancel the contract when in the best interests of the state, without penalty or recourse. The agency is reviewing all non-essential functions in case the threatened shutdown becomes reality. Redflex stock appears to be running out of fuel faster than a parked, idling talivan. From Jan 2 – June 19 09, RDF has fallen a staggering 36.96% on the Australian Stock Exchange. Redflex recently ended a potential sellout process when no “suitable” offers were received for the purchase of the firm. A cynic familiar with the stock questions the degree to which the profit downgrade can be sheeted home to the shooting. “It shows how fragile their business model is as they have to rely on recurrent income from fines for their capital,” he says. This entry was posted on Friday, June 19th, 2009 at 3:16 pm and is filed under News. You can follow any responses to this entry through the RSS 2.0 feed. Responses are currently closed, but you can trackback from your own site. Great pic, great article, and kudos to the cameraperson who got this great shot! Which was probably you, right Glyph? Doing an outstanding job as always, Semper Fi! Nope, wasn’t me this time. Glyph is too smart to take a picture of someone refueling a car and then trying to somehow twist it to imply that Redflex is struggling . He takes pictures of van’s parked on a slope and trys to twist it by telling us that it is about to roll ! Not sure how either one has anything to do with the fact that the cameras are up and while there are a few bills going around at the copper dome…. nothing is happening and no votes !! Last I checked the cameras are still flashing. That pic is awesome! The can at I10 and 202 has been there for over a week. Marked as permanent on a certain mapped database of cameras even. So can anyone elsewhere in the valley confirm that this is the new MO of speed vans, or is the van at I10 and 202 a one off? It seems the moniker “mobile speed van” Doesn’t apply anymore to redflex vans. I still feel bad about the reason the vans became not so mobile anymore. This is for everyone ignoring their tickets, make sure to check your driving record. I heard a pretty terrible story from one of our followers today. Just appears to me to be a vehicle that ran out of gas! What is all the fuss about? I mean its not like the one in the car to the left is the friend of a doctor and is submitting illegal prescriptions!! I thought that all the vans were supposed to be hybrids. And that they weren’t running while they parked on the side of the road. At least that’s what all the pro-camera people were saying when the subject of polluting the air while they idled on the side of the road all day was brought up. Its ok for an officer to leave his/her car on? Where is your love for the environment when it comes to the human cops? I suppose also that you dont have a problem with an officer on the side of the road pointing a radar gun? Maybe you just like your odds of speeding without getting caught if the cameras were not around? Is that your real reason for wanting the cameras removed? Thats where most of you are coming from right? You throw out how unconstitutional they are ( thats just a cover) for the cover that you really want to speed and dont like the fact that you cant whenever you want to like before. I for one can hardly wait for the cameras to go up on the US 60 east….. there will be a lot of tickets issued then !! The troll is strong with this one. You know when it comes down to it, anyone who really likes to go fast loves the scameras since there are yellow signs warning of speed traps, GPS and radar to warn of the traps. Real cops will give you no such warning of a speed trap. Unfortunately, the ones who are getting nailed by the cams are the average joe who forgot for a second to slow down from 65 to 55 for the speed limit drop, or missed the sign because a huge semi was in the way. If you want, you can still have your wet dreams that it is the high end speeders getting all the tickets, but in the end, it is the guy living paycheck to paycheck with 3 kids in a low paying job having to delay paying some bill to pay the 181$ ticket who is getting f’ed by the arizona scam cams. People who want to speed and those who want to protect themselves from the scam already have devices to warn themselves when a camera is up and coming. Yes, Walt. A hybrid, with an electrical system that is turned on. Meaning that the engine has to kick on for a few minutes once and awhile to keep things charged. So they leave these vans out there for a couple days, and once and awhile they stop and put a couple gallons of fuel in them, to keep them running. But ya, CF fanatically and as usual blows it out of proportion saying that it ran out of fuel. Typical CF hype grasping at straws to make a story out of nothing. Wow, the Redflex PR machine is in full swing today. Guess they don’t have the day off for Fathers day in Australia today. I would love to go troll pro-camera web pages… but there aren’t any. Hmm, wonder why that is? Who said that a business can survive without repeat customers? And that is why the pro-camera groups are for the cameras. They can break other laws, such as not carrying insurance, no license or suspended license, no current registration, non-working lights, not wearing seatbelt, failure to change address. Hmmm, sounds like a lot of stuff LAB was cited for back on November of 1994. No wonder he is for the cameras. All these LABs have to do to keep from getting a citation is drive below the camera threshold. We all know the cameras can’t pull over and arrest drunk drivers or people with warrants. Gotta love those cameras. Wow, makes me want to be pro-camera, that way I can break all these other laws and not have to worry. Sweetie, you better make sure you wear your seatbelt, pretty soon the cameras will ticket you for that.